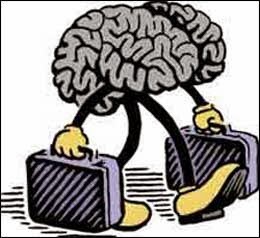 Home / Development / "brain-drain,"
PM: India makes transformation from a country worried about its "brain-drain," to a country that thinks of "brain-gain." The Prime Minister, Shri Narendra Modi, today said India had made the transformation from a country worried about its "brain-drain," to a country that thinks of "brain-gain." Inaugurating the first Global Exhibition on Services in New Delhi today, the Prime Minister said India should assess its "service" capabilities in the global perspective. He said India had vast potential to meet the skilled manpower needs of the entire world, and called for a careful mapping of global needs, which India could fulfil over the next decade. Stating that Human Resource is India's biggest asset, the Prime Minister said India's development journey should focus on the 65 percent of its population which is below the age of 35. He said that as the world looked for skilled manpower, India had the capability to become a crucial provider of this resource. The Prime Minister mentioned sectors such as nursing, high-end financial services, arbitration, tourism, music and vegetarian cooking as examples of what India had to offer to the world, besides the already established IT and other core sectors. Union Ministers Shri Kalraj Mishra, Shri JP Nadda, Shri Ravi Shankar Prasad, Shri Harsh Vardhan, Smt. Smriti Irani and Smt. Nirmala Sitharaman were present on the occasion. The President of India, Shri Pranab Mukherjee has condoled the loss of lives in various districts of Bihar due to powerful storm. In his message to Shri Keshari Nath Tripathi, the Governor of Bihar, the President has said “I have learnt about the powerful storm that hit various districts of Bihar, resulting in the loss of a number of lives, damage to property and injury to many others. My thoughts are with all those affected by this natural calamity. I understand rescue and relief operations are currently underway. I am sure that the State Government and other agencies are taking necessary steps to provide all possible help to the bereaved families who have lost their near and dear ones. Please convey my heartfelt condolences to the families of the deceased. I wish speedy recovery to the injured persons”. The Ministry of AYUSH is organizing Samarpan Dhyanyog Shibir for parliamentarians and their families from 6 pm to 8.30 pm everyday at Morarji Desai National Institute of Yoga, Ashoka Road, New Delhi. The Yoga Shibir is being organized in association with Yoga Prabha Bharti (Seva Sanstha) Trust, Mumbai. Shri Shripad Naik, Hon’ble Minister of State(I/C), Ministry of AYUSH announced this while addressing a Press Conference here today. The Minister emphasised that the Shibir has been organized especially for the Parliamentarians in the first phase as they have a very stressful life and have important responsibilities to cater to the society. Once they understand the importance of Yoga and meditation, they can communicate to masses as well. Later, the Minister urged the common man to start practicising Yoga and contribute in the celebrations of International Yoga Day on 21st June, 2015 and support the mission of our Hon’ble PM Shri Narendra Modi. *One coal block namely, Ardhagram, where the successful bidder was declared, has been handed over to Designated Custodian in view of a Court Case. The Minister further stated that no time limit has been fixed for completing the allocation process of these 204 coal blocks. So far 29 coal mines have been auctioned under the provisions of Coal Mines (Special Provisions) Act, 2015 and the Rules made thereunder. This was stated by Sh. Piyush Goyal, Minister of State (IC) for Power, Coal & New and Renewable Energy in a written reply to a question in the Lok Sabha today. The auction process for non-regulated sector viz. Iron and Steel, Cement and Captive Power was based on forward bidding process where bidders had to submit their final price offer above the applicable floor price. In case of Power sector which is a regulated one, reverse bidding methodology was adopted where bidders had to submit bids below the applicable ceiling price, which shall be taken as fuel cost in determination of power tariff. In case, bid price reaches Rs. zero in reverse bidding, the bidding is based on additional premium payable to the concerned State Government, over and above the fixed reserve price of Rs. 100/- per tonne. *Coal mine has been assigned to successful bidder as Designated Custodian in view of a court case. In addition, an estimated amount of Rs. 1,41,854 Crores would accrue to coal bearing States from allotment of 38 coal mines to Central and State PSU’s. The Minister further stated that out of these 29 coal mines, 16 are operational coal mines included in Schedule-II of the Act and 13 are non-operational included in Schedule-III of the Act. Milestones for development and production of coal from the auctioned coal mines have been prescribed under the Coal Mines Development and Production Agreement signed with the Successful Bidder. The Minister further stated that a few complaints were received regarding cartelization in bidding. It is not possible to conclusively establish the same until investigation are carried out by Competent Authority. The Government has not approved the recommendation of NA for declaration of successful bidder in case of 4 coal mines namely Gare Palma IV/2&3, Gare Palma IV/1 and Tara as final closing bid price was not found to be reflecting fair value, the Minister added. An Inter-Ministerial Committee (IMC) has been constituted in the Ministry of Coal on 12.01.2015 to consider various models including auctioning of coal linkages/LoAs through competitive bidding as the selection process and to recommend the optimal structure that would meet the requirements of all the stakeholders. The IMC has not yet submitted its report. This was stated by Sh. Piyush Goyal, Minister of State (IC) for Power, Coal & New and Renewable Energy in a written reply to a question in the Lok Sabha today. In her address, Commerce & Industry Minister Smt. Nirmala Sitharaman exuded confidence that Services sector would provide the impetus for the future of Indian growth story. Smt. Sitharaman informed that Services sector now contributes 57% of GDP, 1/4th of employment and 1/3rd of the total exports of the country. Dwelling over the importance being given by the govt to growth of services, the Commerce Minister said that GES 2015 has been organized to serve as a platform to enhance strategic cooperation and develop synergies between the players of the services sector in India with its global counterparts. She informed that 63 countries are participating in the Exhibition out of which 39 countries have taken exhibition space. 18 States are also participating. Smt. Sitharaman said that the Indian Growth sector has been led by the services sector and in 2013-14 while the services export was USD 150 Bn, the services import was USD 78 Bn, thus resulting in a services export surplus of USD 73 Bn. Outlining the future abroad, the Commerce Minister said the new geographical territories are being explored and GES 2015 shall serve to engage with the service seekers to take forward the momentum in the services sector. Earlier speaking on the occasion, Mr. Sunil Bharti Mittal, Chairman of Bharti Enterprises, said that India has seen rapid growth in the services sector and the market sector has improved from 1% to 3.3% in 2003 over a period of around 12 years. Dr, Prathap C.Reddy, Chairman, Apollo Hospitals, said that the recent initiative by the govt. in allowing e-visa will facilitate growth of services in the health segment. He said India has the potential to provide holistic health solutions and India can become global health care destination in the times to come. Mr. T.M.Bhasin, Chairman, Indian Banks Association, said that size of banking assets in the country have crossed 2 trillion USD and the banking sector has the potential to become 5th largest in the world by 2020. Dr. Naresh Trehan, Chairman, Services Export Promotion Council noted with pride that number of developed countries are now dependent on Indian healthcare service providers for their requirements. He said that 17% of all the super-specialists serving in the USA are now from India. Dr. Trehan said that there is huge potential that needs to be explored in Japan, China and CIS countries. Fourteenth (14th) edition of Indo-French naval exercise (VARUNA) started with the arrival of four French naval ships at Goa today. Representing the French Navy is Aircraft Carrier Charles de Gaulle, two destroyers Chevalier Paul and Jean de Vienne, replenishment tanker Meuse and a maritime patrol aircraft Atlantique 2. The Aircraft Carrier Charles de Gaulle is carrying its complement of fighter aircraft Rafale M, Strike Aircraft Super Etendard, E2C Hawkeye AWACS and helicopters Dauphin and Alouette 3. Aircraft Carrier INS Viraat, destroyer Mumbai, stealth frigate Tarkash, guided missile frigate Gomati, replenishment tanker Deepak, submarine Shankul and a few Fast Attack Craft are participating from the Indian side. Aviation assets of the Indian Navy participating in VARUNA-15 include carrier-borne fighter aircraft Sea Harriers, maritime reconnaissance aircraft P-8 I and Dorniers along with integral helicopters Seaking 42B and Chetak. The scope of Exercise VARUNA includes the entire gamut of maritime operations from Aircraft Carrier Operations, Anti Submarines Warfare Exercises, Maritime Interdiction Operations to multi-ship replenishment exercise. Regular IN-FN interaction over the years has allowed both navies to gradually and systematically increase the complexity and professional content of the joint exercises. VARUNA aims at deriving mutual benefit from the experiences of the two navies. The confidence gained through such exercises helps develop Standard Operating Procedures, particularly in the fields of Joint Maritime Air Operations Planning with exchange of Carrier Operational Capabilities. The other joint exercises include Coordinated Anti-Submarine Exercises, Surface Exercises, Cross Deck Flying, Damage Control and Fire Fighting, Air Defence, Firing Drills, Air to Sea Firing, Tactical Exercises and Visit Board Search and Seize Operations, which further hone the fighting efficiency of the two combat forces. VARUNA-15 is scheduled from 23 Apr 15 to 02 May 15 off Goa and is aimed at further strengthening bilateral ties between India and France. Relations between India and France have traditionally been close and friendly. With the establishment of strategic partnership in 1998, there has been significant progress in all areas of bilateral cooperation and exchanges including naval exercises. The Indian Navy and the French Navy have been conducting naval exercises since 1983 and following the establishment of a strategic partnership, these exercises were christened as ‘VARUNA’ in 2001. Till date, thirteen such exercises have been conducted and the last exercise VARUNA 12 was conducted in the Mediterranean Sea from 19-22 Jul 12 off Toulon. The Defence Minister Shri Manohar Parrikar has said that the Government is committed to provide all support towards modernisation of the Armed Forces. Addressing the Annual Unified Commanders’ Conference for Tri-Services Commanders in New Delhi today, he said that there is a need to exercise financial prudence and optimise all available resources. Shri Parrikar said though the technology is important for modern warfare, it is ultimately the morale and motivation of our brave soldiers, sailors and Air Warriors which should be a major focus area for all the commanders. The Defence Minister also commended the armed forces for their devotion to duty and the stellar role played by them in safeguarding the country's unity and integrity. He concluded his address with a homage to all valiant Soldiers, Sailors and Air Warriors for their supreme sacrifice in honour of the Nation. Earlier, Chief of the Integrated Defence Staff to Chairman Chiefs of Staff Committee (CISC) Air Marshal PP Reddy presented a report covering major achievements on key Tri- Services issues. On this occasion, the Chairman Chiefs of Staff Committee & Chief of Air Staff and Service Chiefs also addressed the conclave highlighting the major issues pertaining to their respective services. During the daylong conference, key security issues facing the Nation and important strategic, operational, logistical, administrative aspects pertaining to Tri-Services were deliberated upon. The Annual Unified Commanders' Conference (UCC) for Tri-Services Commanders was organised under the aegis of Headquarters Integrated Defence Staff. Minister of State for Defence Rao Inderjit Singh, National Security Advisor Shri Ajit Doval, Chief of Air Staff Air Chief Marshal Arup Raha, Chief of Naval Staff Admiral RK Dhowan, Chief of Army Staff General Dalbir Singh, Defence Secretary Shri RK Mathur and other senior officials of Services and Ministry of Defence were present in the conference.